A photo taken during the trial of Adolf Eichmann. One of the most notorious lines — and lies — that grew out of the trial of Adolph Eichmann for his important role in the Holocaust was what Hannah Arendt called the “Banality of Evil.” Arendt was assigned to report on the 1961 trial of Eichmann in Jerusalem, but according to contemporaries, she rarely attended the trial itself. She came to Jerusalem having made up her mind in advance that Eichmann in particular and others involved in the evils of the Holocaust were ordinary banal functionaries. She reported on the trial with an agenda. It was not necessary for her to actually observe and listen to Eichmann because to do so would undercut her thesis. So instead she wrote a mendacious screed in which she constructed a stick-figure caricature of one of the most significant perpetrators of the Holocaust. I use the word mendacious deliberately, because Arendt knew better. One of Hitler’s key supporters was Professor Martin Heidegger, perhaps the most influential philosopher of his day. Arendt was his student and lover. After the war she tried desperately to rehabilitate him. He was anything but banal. Nor were Göring, Goebbels, Himmler, Hitler, and the numerous doctors and lawyers who were tried at Nuremberg. Neither were the university students who began by burning Jewish books and ended by burning Jewish children. The perpetrators of the Holocaust — from those who organized it in Berlin to those who carried it out in the death camps and killing fields — included some of the most brilliant young men and women in the country. Many left university to participate in the “final solution” and then returned to highly prestigious jobs in post-war Germany. 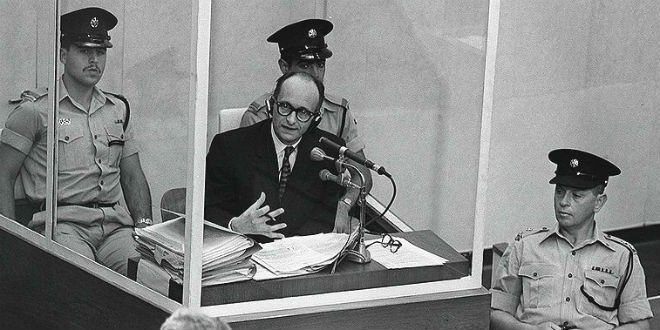 Adolph Eichmann was anything but banal, as a perusal of the trial transcript reveals. In the film “Operation Finale,” he is played by Ben Kingsley. Although the film takes Hollywood liberties — a romance between a beautiful doctor who in reality was a man and the film’s Israeli hero — Kingsley’s fictional portrayal of Eichmann is far more realistic than the allegedly non-fiction account by Arendt. The late Professor Telford Taylor — who was my teacher, mentor, colleague, and friend — had been the chief prosecutor at the Second Nuremburg Trials. He was invited to report on the Eichmann trial as well. He invited me along as his assistant and translator, but I had just been elected editor in chief at the Yale Law Journal and could not accept his offer — a decision I have long regretted. When he returned, he gave me his account of the trial, which varied enormously from that of Hannah Arendt. Where she saw banality, he saw calculation, manipulation, and shrewdness. These characteristics come through far more clearly in the film than in Arendt’s deeply flawed account. In the film we see a highly manipulative, shrewd judge of character who seeks to use his psychological insights to his advantage. Nor was Arendt’s book Eichmann in Jerusalem: A Report on the Banality of Evil, the only effort by Germans to attribute banality and ignorance to the perpetrators of the Holocaust. In Bernhard Schlink’s award winning book The Reader, turned into a critically acclaimed film staring Kate Winslet, a woman who actively participated in the mass murder of Jews is presented as embarrassed by her illiteracy. Readers and viewers come away believing that she may have been more typical of hands-on perpetrators than the SS and Einsatzgruppen. Deliberately distorting the history of the Holocaust — whether by denial, minimization, unfair comparisons, or false characterizations of the perpetrators — is a moral and literary sin. Arendt is a sinner who placed her ideological agenda above the truth. To be sure, there are untruths as well in “Operation Finale,” but they are different in kind rather than degree. Some of the drama and chase scenes are contrived, but what else can be expected of Hollywood. What is important is that Eichmann is presented in his multifaceted complexity, in the manner in which Shakespeare presented Iago, Lady Macbeth, and many of his other evil villains — not as banal, but as brilliantly evil. It is essential to the memory of the victims of the Shoah, as well as to future efforts to prevent recurrences of genocide, that we not engage in ideologically driven and historically false oversimplifications such as “the banality of evil.” That mendacious and dangerous phrase should be struck from the historical vocabulary of the Holocaust and the trial of Eichmann, lest we look in the future for banality and miss the brilliance of those who would repeat Eichmann’s crimes.